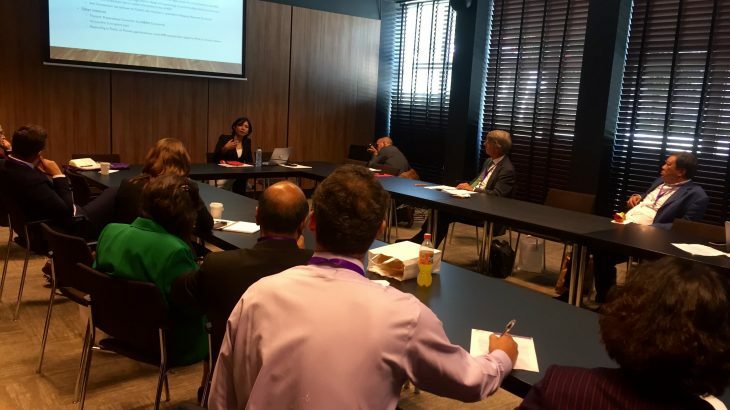 The Hague, 10-13 July 2017 – The Human Rights Resource Centre (HRRC) participated in the World Justice Forum V organised by the World Justice Project (WJP). An organisation known for its Rule of Law Index, the WJO seeks to advance Rule of Law through a multidisciplinary approach. The belief that Rule of Law is not only the domain of lawyers and judges, but rather of everyone as stakeholders, is reflected in the agenda of the forum. The forum availed a venue for hundreds of global and community leaders and agents of change from civil society, business, government, and the media to exchange ideas, develop strategies and collaboration to advance peace, opportunity and equity. The subsequent days saw sessions that discussed pertinent issues starting from the importance of monitoring in criminal justice reform, corruption eradication, furthering gender equality and women’s rights, to designing effective media communication. The significance of civic participation, transparency, and checks and balances in strengthening rule of law became one of the recurring themes in the sessions. World Justice Forum provided ample opportunities for participants to actively participate, including by availing sessions for organisations to discuss innovative ideas to further rule of law in local contexts. HRRC assisted in coaching the session on youth-oriented innovations. On the last day of the Forum, the shortlisted participants pitched their ideas before all the Forum’s attendees who in turn voted for one to be supported by WJP. The winner of this year’s Forum was an initiative to provide free legal aid and consultation in Kyrgyzstan to put an end to bride kidnapping in rural areas. During the Forum, the HRRC also had the opportunity to present its latest baseline report, the “Update n the Rule of Law for Human Rights in ASEAN: The Path to Integration.” The study analysed policy and legislative changes in the 10 ASEAN Member States since HRRC issued its first baseline report on Rule of Law in 2011. Ms. Aviva Nababan, HRRC’s Board Member, presented the report’s main findings in the World Justice Forum before academics, former judiciary, and civil society actors from a number of ASEAN and European countries, including the Philippines, Vietnam, Holland, and Poland. Ms. Nababan highlighted how ASEAN’s diversity is also reflected in the variations in the state of rule of law in its member states. Since 2011, the region has exhibited some positive trends, including the hardening of the commitment to rule of law and human rights affirmed in the ASEAN Charter through various ASEAN declarations, most recently of which is the ASEAN Convention Against Trafficking in Persons Especially Women and Children (ACTIP) that entered into force in February this year. The ensuing discussion touched upon the need for the region to balance its long-held non-interventionist policy with closer, more practical human rights cooperation, including in the field of humanitarian aid. ASEAN, News, Rule of Law ASEAN, Baseline Study, human rights, Rule of Law, World Justice Forum. permalink.